One of Seattle's first certified-organic restaurants, located in a charming Craftsman-style building. : Chef Maria Hines was ahead of her time when she opened this restaurant devoted to all things seasonal, regional and organic. The neighborhood bistro could very well be "the house next door," located as it is in a charming Craftsman-style building, formerly a single-family home. The small, candlelit dining room is painted in shades of green and yellow that glow at sunset. 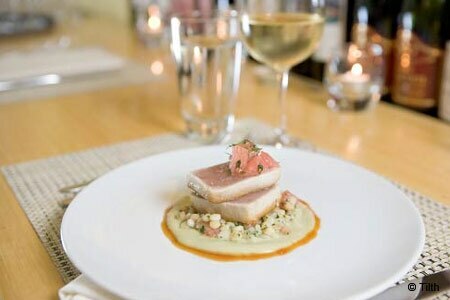 Innovative dishes have included watermelon carpaccio to start and mains such as mini duck burgers with house-made ketchup and pork belly with black garlic. Ricotta cheesecake with Italian plum and butter crumble has appeared among the delectable desserts. Tilth’s carefully chosen wine list focuses on Pacific Northwest and California vineyards. Service can be gracious and polished, but may also be inconsistent.